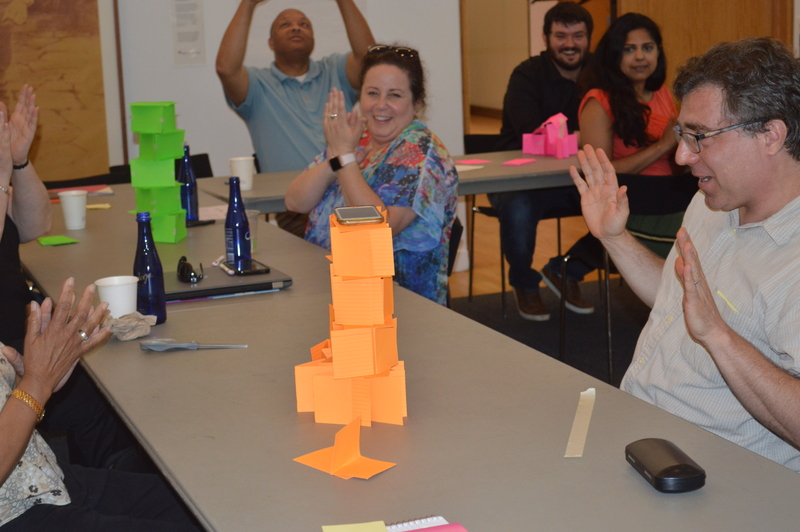 By plane, train, and ferry, 12 professors of Journalism and English made their way to New York City on June 19 to participate in a two-day design and systems thinking workshop hosted by J+D and facilitated by the Institute of Play. They were a mix of faculty from Morgan State University, a range of California-based community colleges, Fordham University, Wagner College and The New School. The Institute of Play brings game design into education using play as a teaching tool. Rather than just talking about the design process, IoP’s Jeremy Engle opened with a game to illustrate it. In seven minutes, teams of three had to build as tall a tower possible, using only index cards and tape. The winning tower had to be stable enough to support an iPhone for 10 seconds. The key to success? The winners used a pair of scissors to test their tower as they went along. “There’s not just a first draft-to-final draft. There’s a process,” Engle said. The New School’s Blake Eskin tested out his team’s index card tower, which successfully held the weight on an iPhone for 10 seconds, as professors cheered on his winning team. That warm-up led to the big activity of the workshop: prototyping a news story using the elements of the design process. Step one: Talk to strangers, something many of the professors said their students struggle with. At Union Square Park, in teams of two, the group asked people about their news consumption habits and interviewed them about the kinds of stories they might want to read. One pair of professors said they were rejected four times before someone finally agreed to an interview. “It reminded me to be sympathetic to my students,” Erin Auerbach, a journalism professor at Bakersfield College in California, told the group. 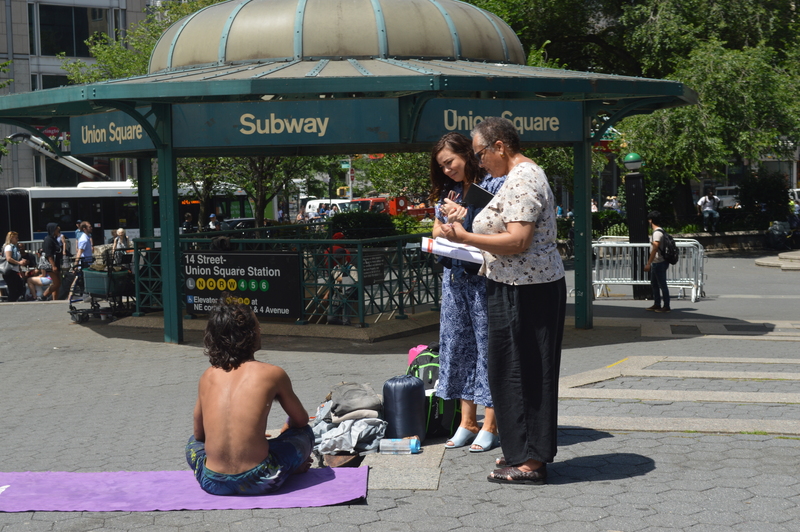 Molly Bedford of Fordham University and Jacqueline Jones of Morgan State University interviewed a man who lives in Union Square Park about how he gets his news. The professors took photos, collected audio, and drew maps of the park. After an exercise in brainstorming, they delivered elevator pitches. The next morning, the teams pitched their story ideas to more people in the park to get the feedback early in the process. Engle encouraged the group to “fail early, fail cheaply, fail often”: a mantra borrowed from designers. Burt Dragin of Laney College, A.J. Brantley, and Jacqueline Jones presented their team’s pitch. The rest of the group was given guidelines for offering meaningful feedback. The idea of putting users front and center was a major takeaway for many of the professors. “It’s opened up a whole world of journalism to have people tell you what they want and how they want it,” said Jacqueline Jones, department chair of Multimedia Journalism at Morgan State University in Baltimore, when the group debriefed the exercise. Having worked for years as a newsroom editor, she said that dealing with audience engagement directly broke open outdated notions about story conception. Auerbach said that she felt as though journalism has progressed from simple report to a conversation to a collaboration with readers and users. “If the industry had come to this earlier, I don’t think we’d be in the shape we’re in now,” Jones added, referring to the recent uptick in public distrust of the media. 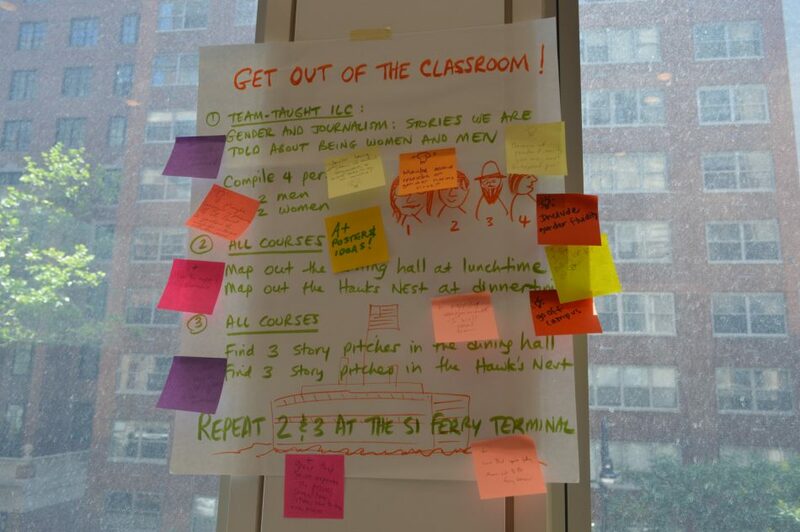 In her curriculum map, Claire Regan of Wagner College wrote that her major goals were to get students out of the classroom to interview strangers more often, both on campus and at the Staten Island ferry terminal. 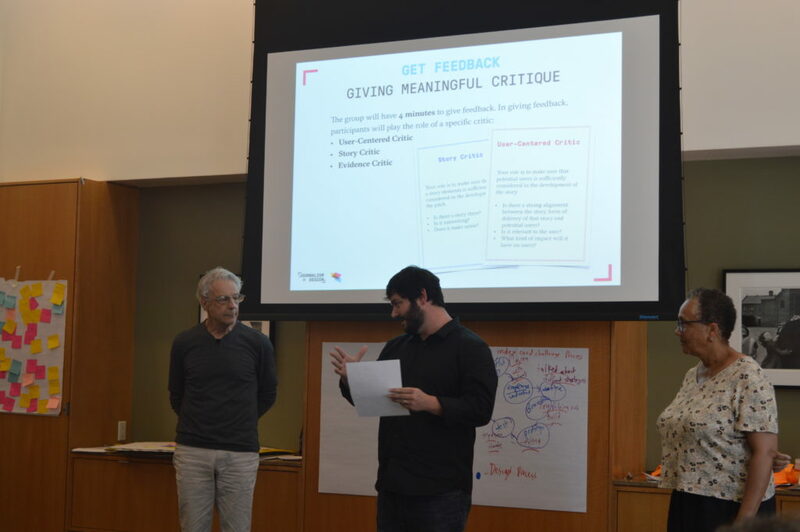 The professors also created concrete plans for how they would incorporate the exercises and big ideas from the workshop into their fall semester courses. Many wanted to introduce more reporting outside the classroom, group work, user research, prototyping and visual feedback exercises. In addition to sharing open source education resources from the program, J+D faculty members will act as mentors in bringing design into journalism classes beyond The New School. The workshop was part of Journalism + Design’s Knight-foundation funded efforts to expand the design-oriented program to other colleges. During a discussion on the current state of journalism, the educators assembled acknowledged that they might not be able to repair it completely, but they have the opportunity to teach the future journalists who will. “This is the beginning of the conversation,” said David Marshall, Strategic Communication chair at Morgan State University. Claire Regan, journalism professor at Wagner College on Staten Island said she has attended many journalism workshops, but this one stuck out from the rest. “[The workshop] challenged me, it engaged me and it offered me new ways of thinking about journalism education,” she said.